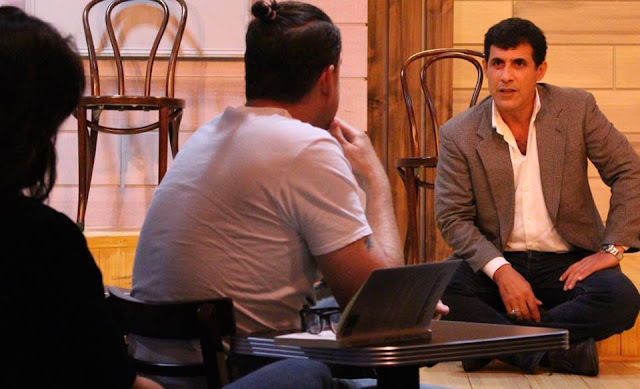 bar none group: Jeff Seymour's Lessons for "The Real Life Actor"
If you've ever been on a film set one of the first pieces of advice that you are given is, "bring a book." There's alot of down time and reading a book helps while away the hours. Especially if you are background. Background is just an industry term for being an extra...all those people in the background of a scene that you shouldn't be noticing. This background player has been seen on screen at a bar with a copy of Malcolm Lowry's Under the Volcano, riding the subway with a copy of Lao Tse and this past week walking a downtown street carrying Jeff Seymour's The Real Life Actor. If you've acted before, Seymour's book will make you rethink your craft. If you are just starting out, The Real Life Actor will open your eyes. Jeff Seymour is no fly by night acting coach or writer. He has 35 years experience on stage and screen and acting is the only job he's ever had. Well, sure, he opened and ran his own theater for ten years in Los Angeles and he's been teaching acting for almost as long as he's been acting. An enthusiastic crowd for Jeff Seymour at Second City. 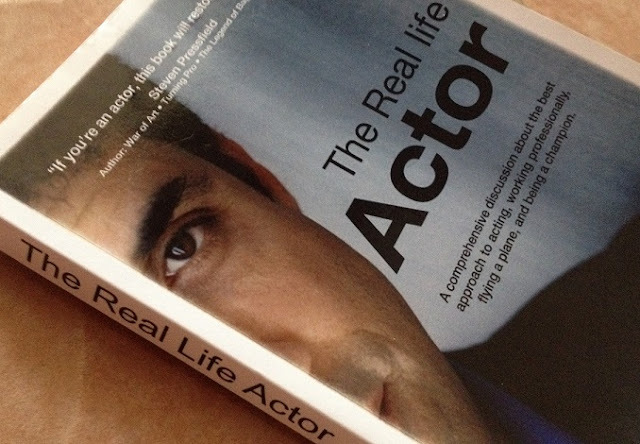 The Real Life Actor is the sum of his experiences in the acting world. Jeff has taken all the acting classes that you don't need to take. You don't need to learn how to act like a tree. You don't need to be back in the womb or the belly of a whale to become a better actor. Seymour's no-nonsense approach to his craft flows freely, clearly and concisely through the almost 200 pages of The Real Life Actor. He tells you to stop acting like an actor and to start thinking like a human. As Seymour sees it, actors get lost in the minutiae but people never get lost in their daily lives. We don't need lessons on how to deal with the loss of a loved one or to communicate a funny anecdote that we tell everyone and anyone. We don't look for cues in dealing with real life situations so why not incorporate our real life experiences and how we adjust to them on the fly into one's acting. He writes in The Real Life Actor, "I'd have to admit that the best work I've ever done has been in life. The dramatic, comedic, romantic and sometimes tragic moments I've encountered while living my life have been without a doubt the most sincere, most connected work I've ever done. In fact, I aspire to be as present and confident when I'm acting in a scene as I am in life. In real life, I'm never concerned with my inflection or how I'm standing or where my hands are or when I should sit. Yet these things always work themselves out and I never seem to do a 'do over.'" Described as the "anti-acting coach" Seymour's book should be regarded as required reading for actors and is another tool to be stored in the actor's toolbox. The Real Life Actor complements Seymour's acting workshops held nationwide and throughout the world. 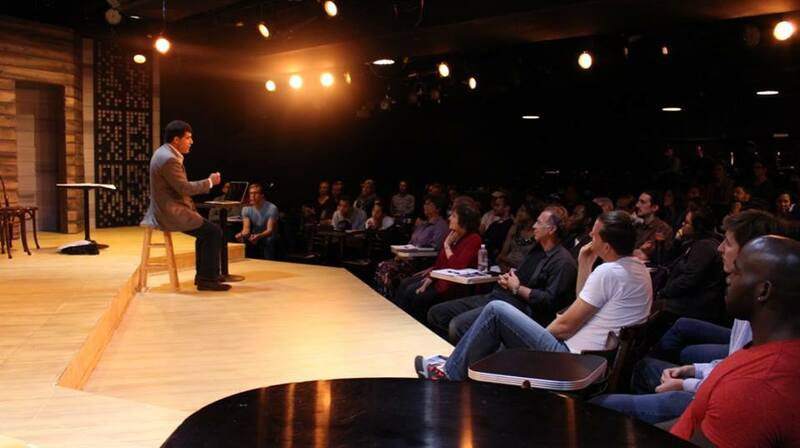 Jeff Seymour will be returning to Chicago on August 8th for a two-day acting intensive workshop. Recent workshops in New York City and Chicago were standing room only and Jeff Seymour is returning to Chicago in early August to impart his wisdom once again. He will have you prepare for a scene on your own. There is no get together, no clandestine meeting between actors in a scene. As Jeff tells it, you don't get to work out scenes in Hollywood in advance. You prepare on your own and work out the scene on set for the first time. Seymour cuts through the bull and gets to the heart of acting. Which in essence is the heart of the actor.